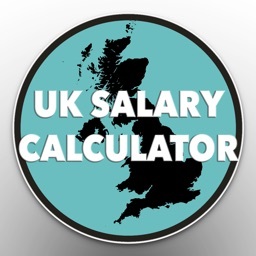 Easy to use UK salary calculator with instant calculations as type from gross to net and take-home to gross for all periods (yearly, monthly, weekly, daily and hourly). The ability to save results makes it an ideal companion to job hunting or pay negotiations. 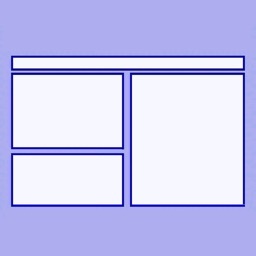 - Save results for later comparisons. - A graph visualizing take-home, NI and tax deductions. We've designed Take Home for UK taxpayers under the Pay-As-You-Earn (PAYE) scheme of the tax deduction. Our goal is to bring a user-friendly app that is easy to use. We've removed all the clutter leaving only the most essential details. This makes Take Home Calculator very easy and quick to use, while very accurate at the same time. 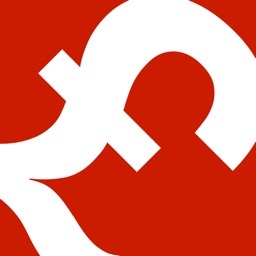 A key feature is that it can perform reverse salary calculations. 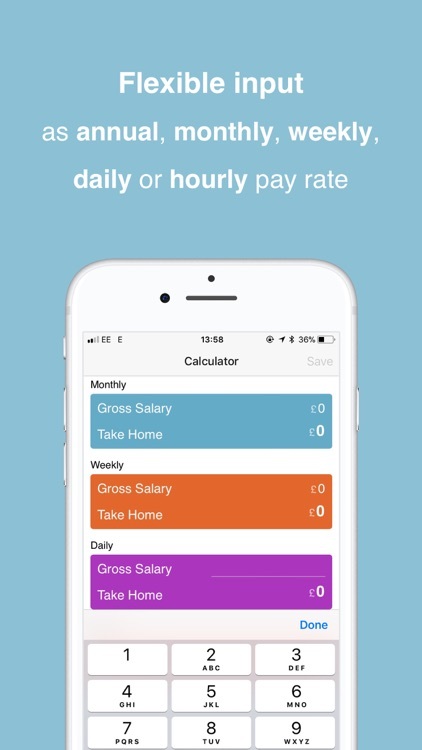 You can enter your desired net pay (what you need to receive after payroll taxes are deducted) and Take Home will instantly work out the salary required to achieve that target. Be it an annual, monthly, weekly, daily or hourly rate; Take-Home can quickly flip between these to work out net pay from gross salary or vice-versa. However, Take Home is not meant to be a replacement for a full tax return or payroll software replacement. But it does provide a quick and useful estimate of the amount you will receive after the taxman takes his share. - Gives instant calculations as you type. 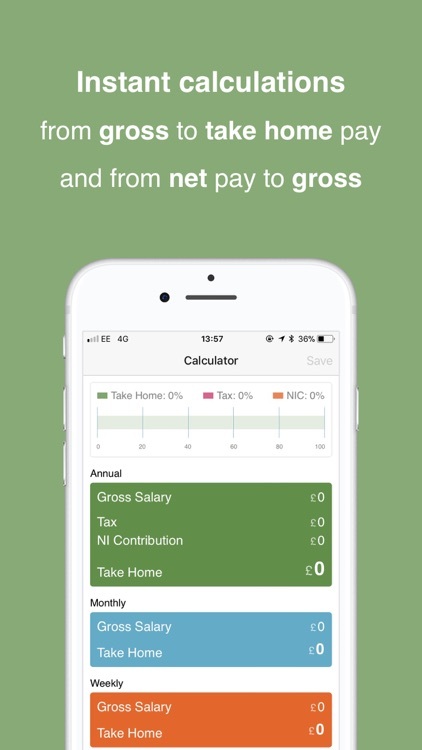 - Shows a breakdown of the calculations: gross, PAYE, NI and net. - Saves calculations for later use. - Allows naming saved calculations. - Flexible periods: enter and view results annually, monthly, weekly, daily or hourly. 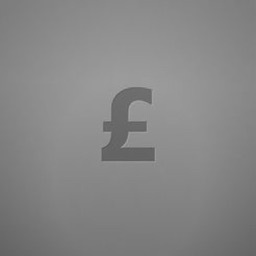 - Calculates your National Insurance contributions. - Calculates PAYE tax for tax year 2018/19. 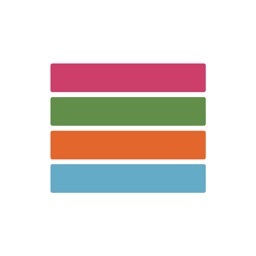 - Provides an instant rough guide. - Works with iOS 10 & iOS 11, and the iPhone X. 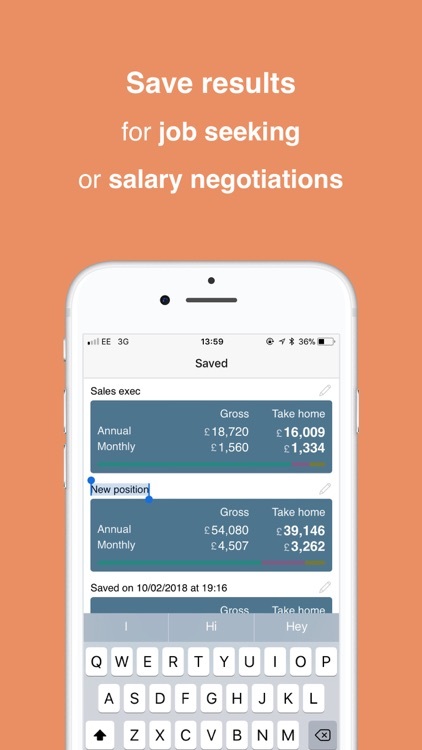 - Enable P45 settings and add your data for more accurate calculations when you're changing jobs in the middle of the fiscal year. 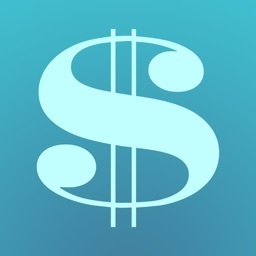 - Contributions to company pensions. - Student Loan repayments (pre-Sept 2012 and post-Sept 2012 schemes supported).